Rowe began his career playing jazz in the early 1960's - notably with Mike Westbrook and Lou Gare. His early influences were guitarists like Wes Montgomery, Charlie Christian and Barney Kessel. Eventually, however, Rowe grew tired of what he considered the form's limitations. Rowe began experimenting, slowly and gradually. An important step was a New Year's resolution to stop tuning his guitar - much to Westbrook's displeasure. Rowe gradually expanded into free jazz and free improvisation, eventually abandoning conventional guitar technique. Rowe developed various prepared guitar techniques: placing the guitar flat on a table and manipulating the strings, body and pickups in unorthodox ways to produce sounds described as dark, brooding, compelling, expansive and alien. He has been known to employ objects such as a library card, rubber eraser, springs, hand-held electric fans, alligator clips, and common office supplies in playing the guitar. A January, 1997 feature in Guitar Player magazine described a Rowe performance as "resemble a surgeon operating on a patient." Rowe sometimes incorporates live radio broadcasts into his performances, including shortwave radio and number stations (the guitar's pickups will also pick up radio signals, and broadcast them through the amplifier). Axel Dörner and Keith Rowe in Chicago, Illinois, 22 September 2004.AMM percussionist Eddie Prévost reports that Rowe has "an uncanny touch on the wireless switch", able to find radio broadcasts which seem to blend ideally with, or offer startling commentary on, the music. (Prévost, 18). On AMMMusic, towards the end of the cacophonous "Ailantus Glandolusa", a speaker announces via radio that "We cannot preserve the normal music." Prévost writes that during an AMM performance in Istanbul, Rowe located and integrated a radio broadcast of "the pious intonation of a male Turkish voice. AMM of course, had absolutely no idea what the material was. Later, it was complimented upon the judicious way that verses from The Koran had been introduced into the performance, and the respectful way they had been treated!" (Prévost, 18) In reviewing World Turned Upside Down, critic Dan Hill writes, "Rowe has tuned his shortwave radio to some dramatically exotic gameshow and human voices spatter the mix, though at such low volume, they're unintelligible and abstracted. Rowe never overplays this device, a clear temptation with such a seductive technology - the awesome possibility of sonically reaching out across a world of voices requires experienced hands to avoid simple but ultimately short-term pleasure. This he does masterfully, mixing in random operatics and chance encounters with talkshow hosts to anchor the sound in humanity, amidst the abstraction." 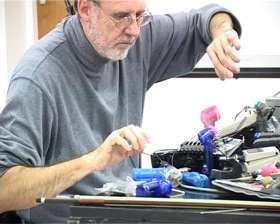 Rowe has worked together with numerous composers and musicians, including Cornelius Cardew, Christian Wolff, Howard Skempton, Jeffrey Morgan, Taku Sugimoto, Otomo Yoshihide, Sachiko M, Oren Ambarchi, Christian Fennesz, Burkhard Beins, Toshimaru Nakamura and Peter Rehberg.